Omega watches have appeared on the wrists of famous people throughout Omega's 150 year history. US President John F. Kennedy had a gold Omega wristwatch, inscribed with "President of the United States from his friend Grant." This watch is now part of the Robert L. White collection of Kennedy memorabilia and is currently on display at the Florida International Museum. Other Omega watches have been gifts among world leaders and seen on the wrist of international celebrities--and not just those who are the paid promotional "ambassadors" of the brand. Even England's young Prince William has been spotted sporting an Omega Seamaster Professional during his travels in 2000 [image: right]. The appearances of the Omega Speedmaster Professional in the real life adventures of the NASA Apollo missions to the moon are well known. If not from people who remember the actual events, then from their appearance in various major films based on those missions, such as Apollo 13 (1995) and The Right Stuff (1983) to name a few. 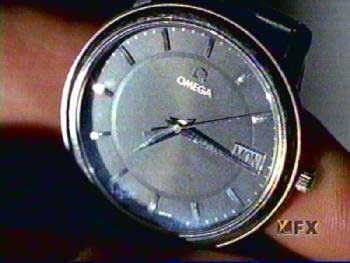 But many fictional characters have also made Omega watches famous. Certainly the most famous is the character of James Bond as portrayed by Irish actor Pierce Brosnan, who has worn an Omega Seamaster Professional Diver in four James Bond films from 1995 to 2002. Omega watches have found their way onto the wrists of other movie and television characters. Some of them have even managed to receive their own full screen appearances. 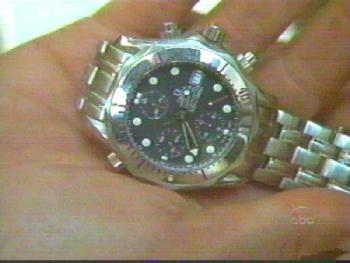 While a portion of these are intentional product placements arranged with Omega's cooperation or sponsorship, there are still a number where the script specifically called for an Omega watch, the costume designer chose one for the character, or the actor/personality was merely wearing their own Omega watch. Chronocentric present this gallery of big and small screen Omega appearances, entitled: "I'm ready for my close-up, Mister DeVille!" For the eighth season of The X-Files, the character of Dana Scully [Gillian Anderson] now wears a men's steel and 18K gold Omega DeVille Prestige, ref #4310.31. In the highly time-oriented episode "Redrum," first aired December 10, 2000, events over several days occur in reverse order. This closeup is seen in the pre-credits treaser, where the watch is shown running backwards. In this film, the character of Beth Cappadoro [Michelle Pfeiffer] wears a vintage steel Omega, ref #2882.20. 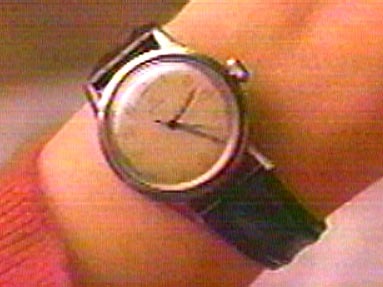 It is seen here in closeup, as Beth checks the time shortly after realizing that her young son is missing. Hey, what can you say, it's an excuse for another close up. FBI Special Agent Fox Mulder [David Duchovny] operating undercover as young professional "Robert Petrie" looks at his steel Omega DeVille Prestige ref #4810.31 to see that his new neighbors have successfully helped him move in to his house before the supernaturally enforced 6:00 PM deadline, in the March 7, 1999 The X-Files episode "Arcadia." In another highly time-oriented plot for The X-Files, the February 28, 1999 episode "Monday" involves the events of the same Monday occurring over and over--with only one person able to see that the events of the day were reoccuring. This called for numerous references to repreatedly establish that the day was still Monday. 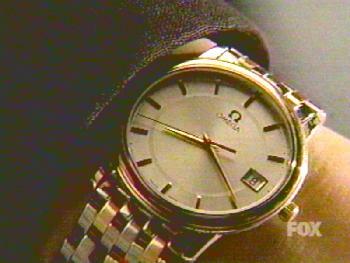 While the steel Omega DeVille Prestige, ref #4810.51 that character Fox Mulder [David Duchovny] wears all season normally displays only the day of the month, a version with a fake date window was dummied up for the episode. The character of Robert Green [Alec Baldwin] receives a steel Omega Seamaster Professional Chronograph, ref #2598.80, as a gift from Charles Morse's [Anthony Hopkins] wife Mickey [Elle Macpherson]. 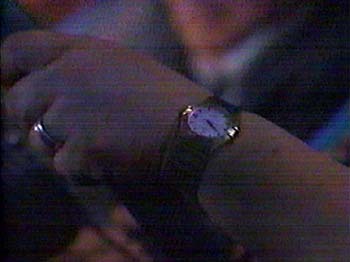 Later in the film, this watch plays a pivotal role in the deeply complex phychological interaction between Charles and Robert. This closeup occurs at the end of the film. A gold and steel Omega Constellation worn by the character of former US President Russell P. Kramer [Jack Lemmon]. Here it is seen in closeup on the wrist of a lady truck driver that President Kramer reluctantly gives it to-- after exclaiming "That's a Constellation. It was given to me by Gorbachev!" --as payment for driving him to another town. James Bond [Pierce Brosnan] has worn the Omega Seamaster Professional Diver in all four of his Bond films: Goldeneye (1995), Tomorrow Never Dies (1997), The World Is Not Enough (1999) and Die Another Day (2002). Additional Omega watches have appeared on other characters in these films. An indentical Seamaster Professional on a strap worn by Agent 006 [above] in Goldeneye, Various Omega Speedmaster models (John Cleese as "Q", several of the villains in Tomorrow Never Dies) and an Omega stopwatch (Die Another Day). For more on Omega and James Bond, see The Omega James Bond Connection. Most certainly, one of the most obvious appearances of an Omega watch in a film has to be the 1995 major motion picture Apollo 13 starring Tom Hanks as Commander James Lovell. This fact-based movie based on the real life incedent of the dramatic failure of the Americal Apollo 13 mission to the moon depicts the authentic NASA approved Omega Speedmaster chronographs that were in use on board the space flight. It was these wristwatches that were used for critical timing operations when the onboard computers were no longer operational. Because of its place in history, the Omega Speedmaster Moon Watch appears in numerous documentaries and programs related to the Apollo missions. The HBO mini-series From The Earth To The Moon features promenently a lingering pan over a post-moon Speedmaster Professional during the opening credits of each episode in addition to many characters wearing them. The documentaries NASA: 25 Years, To The Moon and For All Mankind also feature archival mission footage of Astronauts wearing Speedmasters. The History Channel's series Modern Marvels has done an episode on the Apollo 13 mission. Many of these documentaries and series are available on video tape or DVD. 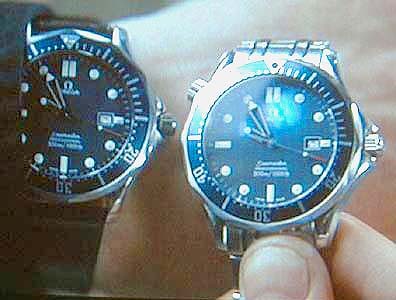 One of the most unusual appearances of an Omega watch in a film would be in the James Bond movie Tommorrow Never Dies, where an Omega Seamaster Professional Diver, ref #2531.80, appears in an x-ray view during the opening credits. In addition to The X-Files references above, the character Dana Scully [Gillian Anderson] wore a steel and 18K gold Omega DeVille Symbol ref #4260.23 throughout the sixth and seventh seasons (1998-2000) of the series and in the 1998 movie The X-Files: Fight The Future. During the eighth and ninth seasons (2000-2002) she instead wore a men's steel and 18K gold Omega DeVille Prestige, ref #4310.31. 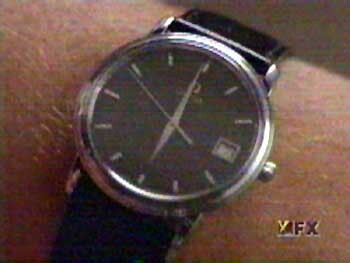 This watch had another full screen close-up in the episode "Trust No 1" which first aired January 6, 2002. In addition to The X-Files references above, the character Fox Mulder [David Duchovny] wore the same steel Omega DeVille Prestige ref #4810.31 throughout the sixth, seventh and eighth seasons (1998-2001) of the series and in the 1998 movie The X-Files: Fight The Future. An Omega Speedmaster Moon Watch, ref #3870.50, worn by the character Nick Chen [Chow Yun Fat] in the film The Corruptor (1999). A Seamaster Professional Diver worn by the character Commander Harmon "Harm" Rabb, Jr. [David James Elliott] in the later seasons of the US television series JAG (1995-2000). A Seamaster Professional Diver occasionally worn by Nigel Marven, on The Discovery Channel's nature documentary series Nigel's Wild Wild World." Speedmaster Moon Watches worn by both male leads (played by Dennis Quaid and James Caviezel) in the movie Frequency (2000). In the comedy movie Undercover Brother (2002), the villain "The Man" wears a steel and 18K gold Seamaster Professional Chronograph, as seen in closeup near the end of the film.